One thing that has surprised me about life in St Petersburg is the juxtaposition of so many different facets of the culture. Petersburg is an old and historical city, and this is to be expected, but it is still fascinating to observe. Walking around the center of the city, you will come into contact with so many different buildings, and sometimes it seems that they have absolutely nothing in common. Walking along Nevsky Prospeck in the heart of the historical city, you can see beautiful churches, like this one. It seems unreal that something like this could exist nestled between shopping malls and restaurants and other marks of the modern world. 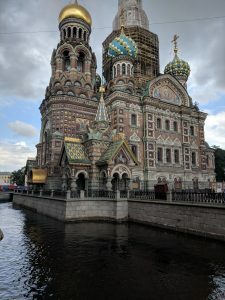 But this beautiful sight speaks to the history of Russia. It is a little reminder that you are in Russia, and not just in any metropolitan city. However this church itself suggests a contrast. The church was clearly constructed to be a holy space, a place of worship to draw people nearer to God. But it doesn’t feel that way. Surrounding the church are dozens of vendors eagerly shouting and competing for the attention of tourists. You need to buy a ticket to see the interior. This is just one example of how contrasts like this exist all over this city. 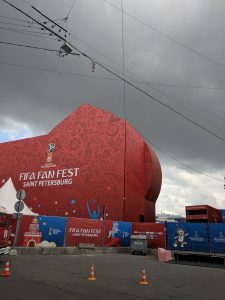 Just beyond this church is the FIFA Fan Fest center, always swarming with energetic fans. It is such a contrast, looking at an ancient church with something like this in the background. 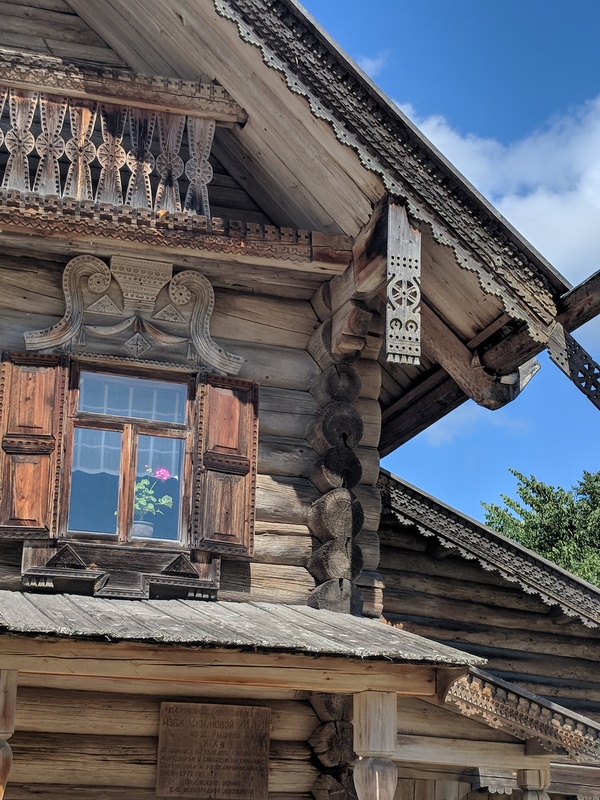 And then there are still other reminders of Russia’s history, like this village house. Buildings like this remind you of the rural roots of Russia. It is so interesting that in one city you can come face to face with so many different facets of a culture. Commercialization and religion, urbanization and rural histories. All of these things are smashed together in this city, and somehow the inhabitants must make sense of it all.